I grew up in the beautiful desert of Northern Nevada. And in the beautiful desert of Northern Nevada, exactly three raindrops fall every 46 years. So, naturally, I never once owned or wore a single pair of rain boots. But I ain’t in Nevada no more. And I just have to tell you….. Jumping in a huge puddle with a pair of these babies on is about the funnest thing I’ve ever done. Puddles are like kiddo magic. You are right, there were not many to be had in Nevada. Way to get in there, Mama! 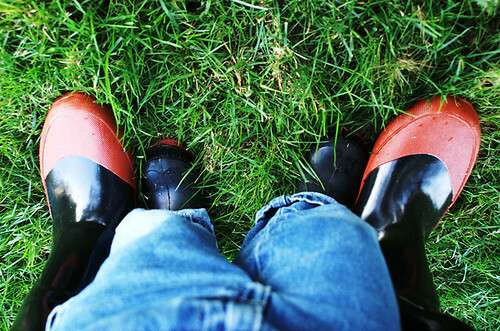 I never got to own a pair of those, but the few times I borrowed them , you’re right…they’re great for puddles! Fun times at the park with our friends! Too bad I was wearing the wrong type of boots that day! hehe, that’s ok! Jumping in puddles is like magic. 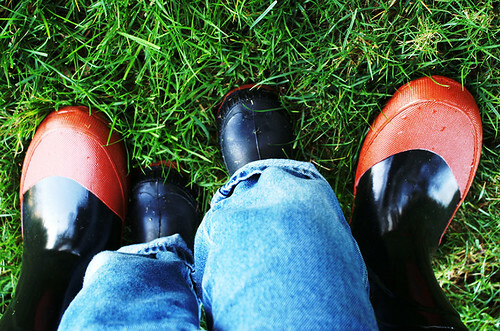 Love both your boots. I’ve never done that either!!! !